The Gately accent table collection offers vintage casual with contemporary function. 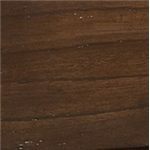 Made of select veneers and hardwood solids in a burnished brown finish, the tables showcase profile edges and frame details with antique bronze color hardware. 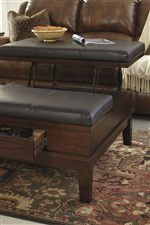 The lift top cocktail table provides tons of ways to keep organized with its storage inside the lift-top, two side compartments, and two drawers. 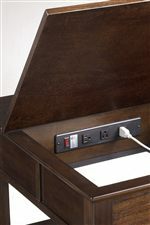 The end table has a hidden storage compartment with a power strip inside its table top as well as a shelf and storage drawers. 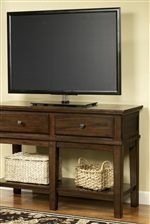 The sofa console table with two drawers and a shelf can function as a sofa table or spot for a TV. Browse other items in the Gately collection from Prime Brothers Furniture in the Bay City, Saginaw, Midland, Michigan area.